If you are an avid manga reader or anime watcher, you are most likely aware of the Japanese death gods, Shinigami. Shinigami have appeared in multiple Japanese series like Death Note, Bleach, Black Butler, and many other titles. These death gods are the eastern counterpart to the Grim Reaper known in Western culture. Shinigami are relatively new to the Japanese culture, as they came about from the western influence of a death being. However, unlike the Grim Reaper, Shinigami are more like angels. Their only job being to help souls cross into the next world. There are many Shinigami that work in unison rather than the singular notion like the Grim Reaper. According to the mythology, everyone’s lives are measured with their death predetermined. This is written in a Shinigami’s book. When someone dies, the Shinigami summons the person. They obey and die. Right before the person dies, however, their shadow fades. Others know death is upon a person by the faintness of their shadow. Also when appending death is upon a person, they return “to the goodness and nobleness he is born with”. Shinigami appear in Japanese religions as well. 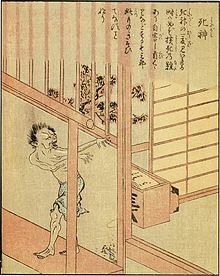 In Buddhism, the Mrtyumara is a demon that makes people want to commit suicide upon possession. The Mara is said to be a Shinigami because of this. In Shinto and Japanese mythology, Izanami-no-Mikoto created death. She is a goddess who is sometimes classified as a Shinigami. I've never heard of this but Shinigami seem pretty cool! It's nice to hear of a "ghost" that doesn't harm you, but rather helps you cross over. Not only that, but I love the concept of having your shadow fade as a way to show that death is upon you. Really interesting topic! Psychics: Real or Rip off?